I've got a couple of gigs coming up in the new few weeks; a solo gig as part of the Southside Sessions and a launch gig to for the new Bearpit Brothers EP. Entry is free and it starts at 8.30pm. 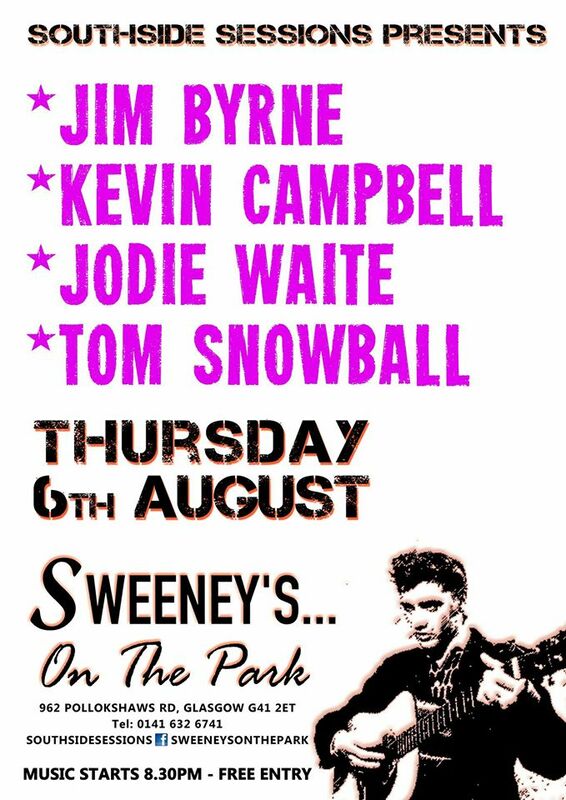 Also on the bill will be Kevin Campbell, Jodie Waite and Tom Snowball. 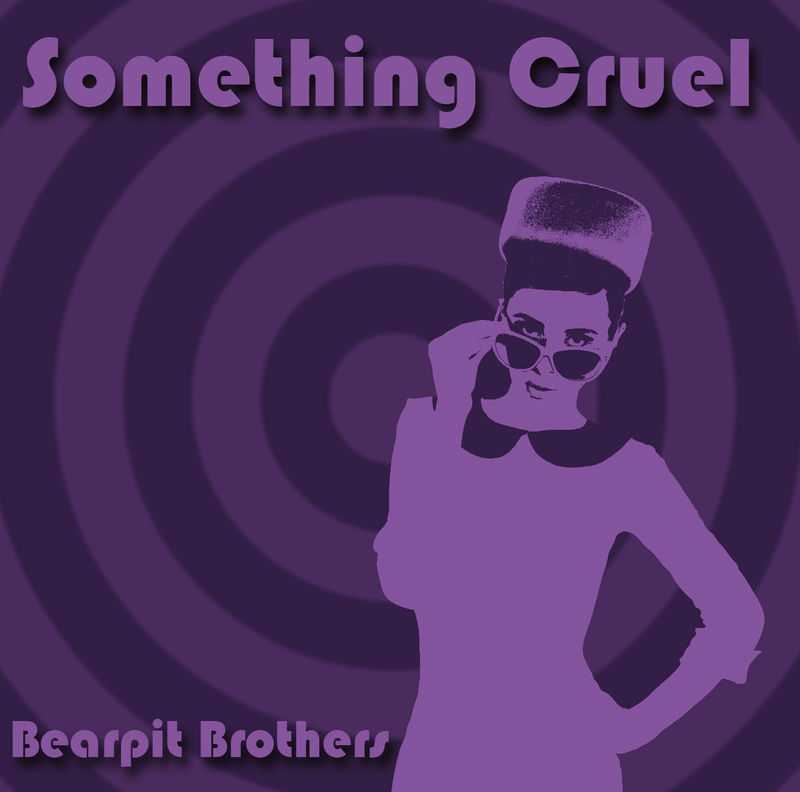 Bearpit Brothers launch their second EP, 'Something Cruel' in the Glad Cafe on 22nd of August. "Although heavily influenced by early 60s 'beat' sounds they are a 'thoroughly modern' group - with a literate, quirky approach. Think early Beatles having a fight with Richard Hawley. " "exquisite guitar duelings with twang and reverb battling away." Blabber 'n' Smoke. "A rare chance to see the hugely entertaining Bearpit Brothers perform live, simply not to be missed." Support will be from the super talented singer songwriter Ryan Morcombe and poet Stephen Watt. I'm playing on the 25th of this month as 'special guest' of Martin Stephenson and Scott MacDonald in the Roxy, Great Western Road, Glasgow. It all kicks off at 8pm. I can't wait to strap my guitar on and play some finger-pickin' acoustic music again. It's all go - for some new songs, some old songs and maybe even the odd cover song. Also on the bill The Optimystics. With this line-up it's a guaranteed night of great entertainment. The EP launch night at the Glad Cafe was fantastic; a great mix of poetry (Aidan MacEoin), prose (Elaine Reid) and music. The music of course came from the Bearpit Brothers; we played the songs from the CD plus a couple of new songs and when the crowd called for more - we played an old Dexter Slim and the Pickups song (Facial Scar) as an encore. It’s a brilliant EP - you really need to get yourself a copy. It is now available online at iTunes, Amazon, CDBaby, Bearpit Brothers website and more or less everywhere online that sell top quality music. Also available in the Independent Record stores ‘Love Music’, 34 Dundas St, Glasgow and Big Sparra Vinyl 29, Burns statue square Ayr. 'exquisitely-crafted debut EP. Four compelling and original songs, showcase understated vocal and shimmering instrumental skills, to break new ground -- while neatly homaging past musical masters. - Colin MacDonald of Folkal Point, Folkal Point, Celtic Music Radio. Go buy it: iTunes, Amazon, CDBaby, Bearpit Brothers website. The second of the Icarus Club's Spring season of shows features Benny Gallagher. He's worked with some of the best-known names in the business and has written for the likes of Art Garfunkel, Bryan Ferry, Don Williams, Garth Brooks, Joe Brown, Mary Hopkin, Phil Everly, Rita Coolidge and Simon and Garfunkel to name but a few! After four decades he remains one of the UK's best-loved singer-songwriters. Supporting Benny will be Janette Geri, Jim Byrne, Richard Llewellyn-Davies, all of whom have appeared at the Icarus Club's weekly events in the local area. On Sunday night I played at the Wee Folk Club in Edinburgh - and it was one of my most enjoyable gigs. A significant reason for this was that I played without a PA system; it was a small and intimate venue and there was no need for any amplification. I loved it; I heard my guitar and my voice exactly as I hear it when I play at home; I didn't have to adjust to hearing everything coming through a set of speakers; which always throws me when playing 'live'. I think that playing through a PA system can have the effect of knocking the subtlety off my playing; nuances are lost in the overly sharp noise that PA systems tend to produce - I think I probably subconsciously adjust my playing to be slightly more bombastic and direct; that's what it feels like anyway. It also makes playing feel more like hard work; ironically being amplified makes me hit the strings harder as it seems more difficult to hear exactly what is coming out of my guitar. Without the amplification system, communication with the audience was direct; there was no microphone stand or stage to separate the performer from the audience; I felt a lot more comfortable with this setup and consequently I was more relaxed in my playing and my chat. Now of course playing without a PA system isn't a revolutionary new way of playing music; most folk sessions are played exactly like this as are most relaxed get-togethers. However playing like this at a 'gig' does feel like an improvement over the usual plugged in affair. Playing big gig in King Tuts Wah Wah Hut - probably in the mid 90s: drums pounding as part of our dramatic big intro; me bouncing around with coiled energy and intent, ready to launch into opening power chord; swing arm for dramatic start; nothing; guitar isn't plugged in. We've (i.e., me and Pat) just finished a wee mini-tour of London; playing Tuesday, Wednesday and Thursday of last week in different venues. The highlight was the gig in What's Cookin' - upstairs at the Sheepwalk in Leytonstone. It is a fantastic venue - made so by Stephen who runs the club. Stephen has really made a big effort; the stage is elaborately decorated (check the photos) - the country and rock 'n' roll sounds from the resident DJs were great; he also does a great job as a compere - setting the friendly upbeat tone. All that was needed was great live music, which on the night was supplied by The Sounthern Tenant Folk Union; an energetic bluegrass/country band. The place was packed with music lovers, all primed to enjoy good tunes. It was a great crowd to play to; I loved it. One of the very best gigs I've done in my short solo career; I had them singing along at the end. I must have done pretty well myself - as I got calls for an encore - which I duly played. Great that our friends, Elaine McIntyre and John Ellis, who live in Leytonstone managed along. They are brilliant company and John (ex-Strangler) is a real muso so I enjoyed hearing his take on the night. The Tuesday and Thursday gigs also had their own character - and I enjoyed both - not least because the other acts were all excellent and also friendly people. At the Icarus club we met with a singer songwriter 'Hortag' from Holland, a local blues player Mississipi Olly McDonald and a five piece band called 'All Things Considered' - playing folky tinged music with a bit of pop thrown in. We had a good chat with Mississipi Olly McDonald and his partner Stephanie, who very kindly gave us a lift home. Great players all. Andy of The Icarus Club is another brilliant host and I'm was delighted to hear that I will be invited back to play at one of their shows they have three times a year in Blackheath Town Hall. Thanks for the gig Andy. A big thanks to Pat's friends Alex and Mary who put us up (and put up with us) while we were in London. They have a beautiful flat in Blackheath - a small characterful part of London - worth the visit on its own. While in London we also did a lot of wandering around and lots of looking at buildings, shops, restaurants and tourist attractions. The trip along the Thames on the boat was particularly memorable. Prior to the London trip we had an great weekend at the songwriting workshop at the Friars Carse hotel in the Dumfries and Galloway countryside. The event was run by Martin Stephenson, Helen McCookerybook and Scott MacDonald. The weather was glorious the entire time - which is always a mixed blessing for me as I suffer from hay fever. I felt humbled by the people there - writing songs directly from personal experiences; the song by Trystan Lewis about his third child was particularly beautiful and moving - a great song. I've been filled up to the brim with music these last few days. On Monday I supported Otis Gibbs at the Twisted Wheel as part of the Americana Festival; on Tuesday recorded a song with Bluegrass band, The Moonshiners; and last night opened for blues legend Hans Theessink at the Edinburgh Folk club. Now the great thing about getting 'out to play' is that you can see and learn from people who are masters of their craft. (The not so great thing is that you get completely knackered in the process.) Both Otis and Hans are individuals to be admired; traveling the world on the back of their own talents; grasping what it takes to put on a show and having the skills to do it; and inspiring others (like myself) with their love of music. It was a privilege to play on the same stage as Otis Gibbs and Hans Theessink . On Tuesday I recorded a song for my next CD with The Moonshiners. At the risk of sounding like I'm overcooking the flattery cake (whatever that is); I absolutely loved playing with The Moonshiners; great musicians, generous people (for accommodating my request to record) and again real music lovers. Thank you to The Moonshiners. It wasn't the easiest of nights for the band as it was a case of learning the song and recording it in one 'live session'. No overdubs here; just press record, count in - and you are committing a real performance to tape. Recording can become an exercise in building a musical house (so to speak) one anxious brick (or 'take' if you like) at a time - hoping that the result doesn't reflect the stress of the process. To record while actually playing with the band - all in the same room - with no headphones and hearing every note live - was refreshing. The Moonshiners are the real deal when it comes to playing music - and real nice people. I had a busy but enjoyable weekend playing music; on Saturday I chatted and played on Alex Jenkins Celtic Music Radio show, which was part of an outside broadcast from the Whiskey Bar Oran Mor in Glasgow's West End. It was a really fun show. And because the Celtic Music Radio people were so friendly I felt very relaxed myself, which meant I did more chatting than singing. The show has been added to the 'Listen again' function of the Celtic Music Radio website; go have a listen it's quite entertaining: Jim Byrne on Celtic Music Radio. You will have to excuse my croaking voice; we had been getting work done in the house and the dust had got to my delicate chest and lungs. The croak gave my voice a bit of character - though I found it very hard to sing; unfortunately I did sing a bit out of tune on The handles broken. On Sunday I played a set at the Butterfly and Pig; mostly new songs that I'm recording for my next album - it was good to give them a public airing. The pub was very noisy, but I felt the songs went down well and I enjoyed playing a fresh set. There were friendly faces in the audience including the crowd from Celtic Music Radio (Ciaran Doris, Stepanie Greer, Paul Baird and Mary Kathleen Burke). Mary and Paul got up and played some songs; great singing and playing as usual; what a fantastic voice that girl has! Also nice to see Paul's expert guitar plucking for the first time; I hadn't realised he was such an accomplished player. After the music myself, Pat and Mary had a good chin-wag about the music scene in Glasgow - and about the issue of musicians not getting payed to play - which had been highlighted by Vivien Scotson and discussed on Mary's show earlier in the evening. The discussion went on so long that we were the last out of the pub (after 1pm I think); an unusually late night for us; so today I'm completley knackered. Good to clear out the cobwebs though. I'm happy to report I've been accepted to play the Celtic Connections Danny Kyle Open Stage, on Tuesday the 27th at 5pm. I'm looking forward to it as this is a gig I've been wanting to do. Lots of interesting gigs and chances to play - coming up. Today I'm playing at Borders bookshop on Buchanan St in Glasgow. Should be fun - and will be able to put my CD on sale to passing trade. :-) Come along and say hello if you are in the city. I'm very familiar with Borders bookshop; treating bookshops like they are libraries is a popular pastime of mine, i.e reading the book in the bookshop rather than buying it. I don't feel guilty about this - because 'over the piece' - so to speak - I do buy loads of books. Apparently I'll be the last to play a gig in Borders, as they are stopping them. Other gigs of interest coming up, include, playing a song at the Glasgow Festival of Songwriting in Dows (Dundas Street), being accepted to play at the Lomond Festival Open Stage, and at Leith Folk Club (date to be confirmed). Busy busy busy. Luckily my left hand is getting a bit better - so I'm able to play my guitar again - which helps when it comes to playing gigs.